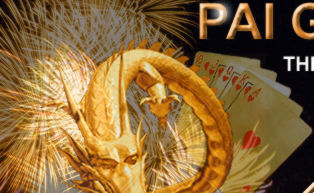 If you're familiar with the rules of normal draw poker, you'll find it pretty easy to get up to speed with Pai Gow. The game is played with a 53 card deck - a standard deck plus one joker which plays as the wild card. The game begins with each player being dealt a 7 card hand. From these 7 cards, the player must create to hands - a 5 card 'highest hand' and a 2 card 'second highest hand'. The dealer will also draw 7 cards and split them into a 5-card highest hand and 2-card second highest hand. In order to beat the dealer, you must beat both his hands with your hands. That is, your highest hand must beat his highest hand and your second highest hand must beat his second highest hand. If you win only one of the hands, the bet is pushed (ie you don't win or lose). If the dealer wins both hands the bet is lost. Hand rankings follow general poker ranking rules. See below for the order of hand rankings. One crucial rule that must be followed when splitting your hand, is that the 5-card hand must always rank higher than the 2-card hand in poker terms. For example, if your seven cards are: King + King + 9 + 7 + 5 + 4 + 3, you cannot place the two Kings in your second highest hand. The pair of Kings must be kept in the highest hand. If your 7 card hand contains 2 pair, you can place one pair in the second highest hand, but this must be the lower pair. When playing online the computer will not let you form an illegal split (no penalty is imposed for trying) so you will soon get the hang of this rule. Winning hands pay even money less a 5% house commission. When the player and the dealer compare hands that have the same rank, that hand is referred to as a "copy hand." Unfortunately in Pai Gow the dealer wins the copy hand. (ie unlike blackjack where same hands push). Pretty simple game really. Hope this was helpful and good luck!